I’ve spent several weeks with the iPad Air 2 as my primary computer, now, and thought this would be a good time to share some thoughts on what I would consider to be the most essential iPad accessories. I’ve purchased a few of these products already while others are on their way or will be purchased when the need for them arises. All of these items are what I would consider to be the best of all of the most essential categories — stand, Bluetooth speaker, charger, drawing stylus, and sleeve. I’m still using the original Compass by TwelveSouth that I purchased nearly five years ago for my first-generation iPad. But, every review I’ve read claims the sequel to be even better than the original. It’s built out of a sturdy aluminum with rubberized feet and has rubber pads and strips along every point at which the iPad would come into contact with it. The stand can be set in two different positions — laying back on its shorter flip-out leg for more comfortable typing or standing up in a vertical position which is great for viewing media. 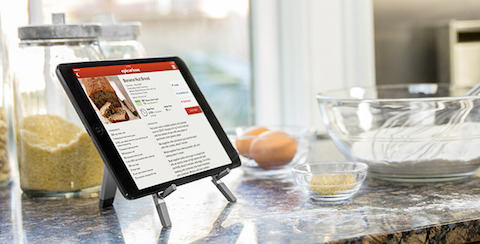 My two favorite features of the Compass is that it actually holds your iPad up off of the surface it’s sitting on — which is great for use in messy places such as the kitchen. And, it’s great for traveling as it can be easily folded up into a compact size and comes with a handy carrying case. Even though one of my Compass’s feet is a bit wobbly, I’m still in love with it. And, I guess that’s the kind of wear you’d expect from an accessory you’ve been using for over four years. When my Compass eventually bites the dust, I wouldn’t hesitate to purchase the Compass 2. TwelveSouth designed a great product that’s needed very little revisions over its relatively long lifespan. The Compass 2 is available in silver, black, and red for $39.99. While not strictly an iPad accessory (I use it just as often with my iPhone), a Bluetooth speaker is an incredibly useful device that I use for music, podcasts, and the occasional episode of Boy Meets World with my fiancée while we eat lunch. The Jambox travels well because of its compact size and even comes with a nice felt carrying case to protect its audio-in jack and speaker grill. I’ve taken it on road trips, to a friend’s house for music during board games, and even to outdoor gatherings. It’s handled it all well and everyone who interacts with it has commented on its superb build-quality and impressive volume (considering its small size). I’ve been using the Jambox for nearly two years and it’s another device that I would gladly purchase again if I ever needed a replacement. Although, next time I think I’ll go for something a little more colorful than my current all-black model. The Jambox starts at about $100, comes in several colors, and is available in three sizes — the original, MINI Jambox, and BIG Jambox. This is the first accessory on my list that I don’t actually own. ButI have been keeping my eye out for a nice two-port wall charger that I could use with my iPhone and iPad when traveling, and this is my current front-runner. Whenever my fiancée and I take a road trip to visit my family in Pittsburgh we end up taking at least three chargers with us — one for each of our iPhones and one for the iPad. You might assume that I would be better suited with a charger that can support three or more devices, but that’s not the case. My fiancée and I both prefer to have our own iPhones on our own side of the bed so that we can get to them more easily in the middle of the night, set separate alarms, and be able to use them before we fall asleep without having to ask the other to plug their phone in. The Anker 20W charger has some fancy amp-adjustment technology they call “PowerIQ” that they claim identifies the device plugged into it and adjusts the amperage it delivers to charge it as quickly as possible. It sounds like an interesting pitch, but truthfully I just want a compact accessory with two USB ports I can plug my gadgets into when I travel. And, anything beyond that is just a nicety. 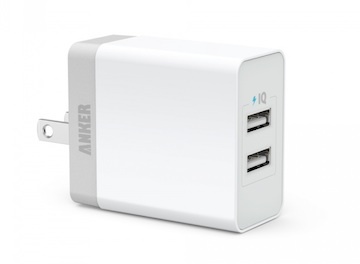 The Anker 20W 2-Port USB Wall Charger comes in black or white and is available for $12.99. I’ve been known to beat the anti-stylus drum, but the Pencil by FiftyThree isn’t made for use throughout the entire interface (although, you could use it for that if you felt so inclined). The Pencil is designed to be used for drawing. 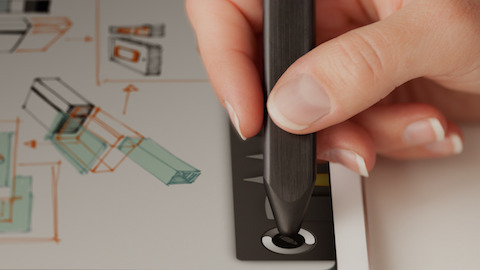 It connects with the iPad over Bluetooth which allows Paper (FiftyThree’s drawing application) and other apps which support Pencil to ignore input from your palm and tell the difference between the Pencil’s tip and eraser ends. It features pressure sensitivity, great battery life, and built in magnets to keep your Pencil and iPad together in the gold and walnut models. It’s very comfortable to use and has been very responsive during my time with it. My fiancée has had mixed results with it, though. She’s had the occasional Bluetooth disconnect and situations where Paper misinterprets input as if it was coming from a different source — smudging when it’s supposed to draw or drawing when it’s supposed to erase. But, those problems haven’t cropped up more than a few times and are easily remedied with Paper’s rewind feature. I don’t have much experience with other styluses, but I’ve been quite happy with the Pencil. I’ve used it for jotting down ideas, quickly building checklists, and my fiancée has spent hours drawing with it. It’s not the cheapest stylus available and it’s extra features aren’t supported by every application, but if your drawing app of choice is supported, I think it’s well worth the price. Pencil is available in graphite, gold, and walnut with pricing starting at $49.95. Update: I wrote a review of the Bear Motion and it wasn’t very good. The last accessory on my list is also one I haven’t used yet (Amazon tells me to expect it here tomorrow). But, it’s the best iPad sleeve I’ve been able to find after hours of searching. There was a few key pieces of criteria the sleeve had to adhere to: it needed to be as slim as possible while still having enough room to house the iPad (obviously), a TwelveSouth Compass, the Pencil by FiftyThree, and a pair of earbuds. The Bear Motion looks like it will be up to the task. I’d also like it to hold a charger and a USB to Lightning cable, but it wouldn’t be a deal breaker if I had to put those in another bag while traveling. I suppose I’ll have to wait until tomorrow to see how much it can actually hold. The other reason I was drawn to this particular iPad sleeve was its design. It’s made out of a very attractive felt and features a leather string and button mechanism to keep it closed. Many of the other sleeves on the market that had similar design aesthetics didn’t also feature pockets for small accessories — if the sleeve didn’t have pockets I didn’t even bother investigating any further. 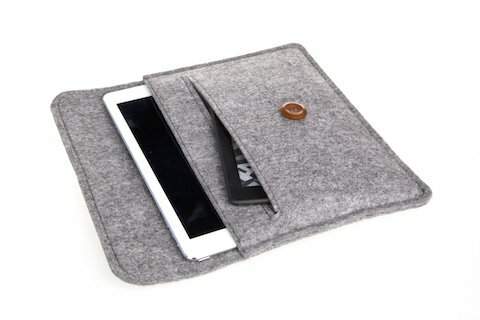 And, it was also surprisingly difficult to find an iPad sleeve that completely covered the iPad — many of them only had thin straps while others relied on friction alone to keep the iPad inside of the sleeve. These weren’t even considered, I can’t risk my iPad falling out of its sleeve while I’m walking around or while it’s in a larger bag with other items. The Bear Motion for iPad Air 2 is available for $10.99 (and also comes in sizes for Samsung tablets, MacBook Air, Kindle, and iPad Mini if you’re interested). Of the lot, the Anker charger is the only accessory I haven’t yet put my money behind. But before I do more traveling this summer I’ll probably pick one up to simplify packing. Personally, I think this covers the gamut of accessories that most iPad owners should own or at least consider owning. You’d be hard pressed to find someone that owns an iPad that didn’t feel the need to purchase at least one of these accessories during the lifespan of their device. I’m extremely excited to get my hands on the Bear Motion sleeve later this week. The last iPad sleeve I bought was a simple Incase sleeve with no pockets that I purchased on an impulse before a trip in 2010. I’m hoping I’ll be happier with this one than I was with the last, which just didn’t suit my needs. My biggest concern is about build quality. Let’s be honest, $10.99 is a pretty low price. I just hope I’m more inclined to describe it as inexpensive than as cheap.